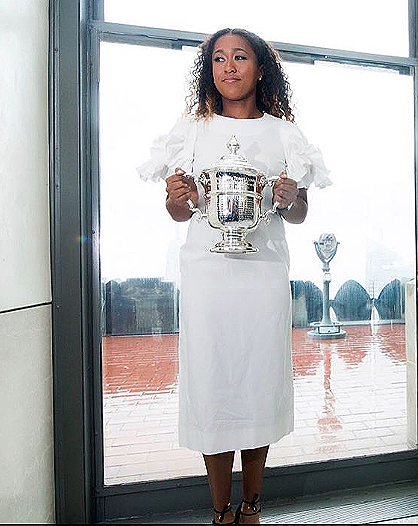 Caribbean roots Naomi Osaka, the new US open champ in a glam shot posted to Instagram Monday, Sept. 10, 2018. News Americas, NEW YORK, NY, Tues. Sept. 11, 2018: The tears are gone along with the black visor used to hide her face at the US Open trophy ceremony on Saturday, Sept. 8, 2018. Instead, the new US Open 2018 women’s champ, Caribbean roots Naomi Osaka, is all glammed up and finally smiling. The Japanese Haitian star posted a photo of her in a gorgeous white dress, hair down, a smile on her face and trophy in hand to her Instagram feed Monday much to the delight of her fans as she added a thank you. The post quickly went viral, securing 212,238 likes. Many fans called her a “young queen” while others lauded her poise and grace. “You are the epitome of class and you were absolutely robbed of what should have been a huge and special moment for you. Shame on Serena, shame on the USTA and shame on the fans…it was a disgrace to watch. CONGRATULATIONS YOU EARNED THAT WIN!!!!! !,” commented ashcas33. The posting comes as many continued to discuss the melt-down of Serena Williams on the court in the finals Saturday and the conduct of both her coach and referee as well as the game in general. Has His Love of Bolivia’s Street Dogs Gone Too Far?